Unbelievable Attrocities | Nan Tubre Writes . . .
Like everyone else in the world, I am appalled at the current events that beset the Boston Marathon. It is an unimaginable disaster. I can’t begin to fathom what kind of human being would perform such an unprovoked, grizley, unspeakable act of murderous intent. It, like the 9-11 catastrophy among others, speaks to today’s society of deviants bent on causing disruptions and chaos to the rest of the world. What happened yesterday at the Boston Marathon, happens in many places throughtout the world everyday. Think of it. Wait. Excuse me for asking you to think of it. Of course, you have already. How could anyone not, considering the state of war we are in? What I can’t/won’t wrap my mind around are the millions of innocent victims that have succumbed to such needless acts of violence under the various umbrellas of religion, boundries, civil rights, you name it. It makes me sick at my stomach. It makes my heart bleed. It goes without saying that there were many, many local heroes who just happened to be on the scene. By that, I wish to imply that Divine Intervention was in place. Of course, we probably will never know why Divine Intervention didn’t prohibit the attack, but thank God, it wasn’t worse. It could have been. It might have been. And what about North Korea? What the hell is that all about? I am ashamed – because I consider myself a Christian and a somewhat kind person – to say that that man postures like a baboon, intent on causing calamity of the worst kind. I can’t truly say his actions are unprovoked, but what do I know? His father was that way, and his grandfather was that way. On the other hand, South Korea and the U.S. have been performing maneuvers and exercise training for quite some time fairly close to the North/South borders. No wonder the world is paranoid. There is reason to be. Dear God, I pray please don’t let the worst happen. On to another attrocity: We live in the country. We have neighbors, not close, but well within eyesight. Get this – some people of unsavory character actually thought it would be cool to burglerize the property of a 70 something old man across the road from us. They crept in during the dead of night and relieved the old man of a ton of his prized tools and machines from his barn. These are things he has worked hard to come by. Thankfully, they only robbed him of things, not life, which could very well have taken place. Oh, and one other thing they took is his feeling of security in his own home. Such a shame. Heightened security is everywhere these days. On a different note – Our baby granddaughter was at our house yesterday. It is such a joy to be around such innocence! She is a total delight, or so I thought. As was fitting for a day that was traumatic already, she tried out her razor sharp new teeth on my finger. Then she wouldn’t let go. I don’t know why. I had to pry her little baby jaws open, which of course upset her to no end, to withdraw my almost bloody finger from within that perfect little cupid-bow mouth of hers. Can I tell you how much that hurt?? It felt like she had a pair of sissors in there instead of new baby teeth. I was reminded of one of those aliens on the TV show from forever ago called V. My sons never did that to me. My other grandchildren never did that to me. I hope it isn’t a prelude to what kind of little demon, oops, I mean angel, she is going to be. I love that child, really I do. When bad things happen, I find the older I get, the harder it is to mentally process some things. It seems the hurts hurt more. I was outside in the early misty morning mulling over the state of the world. Looking up, I was blessed with a beautiful sight. 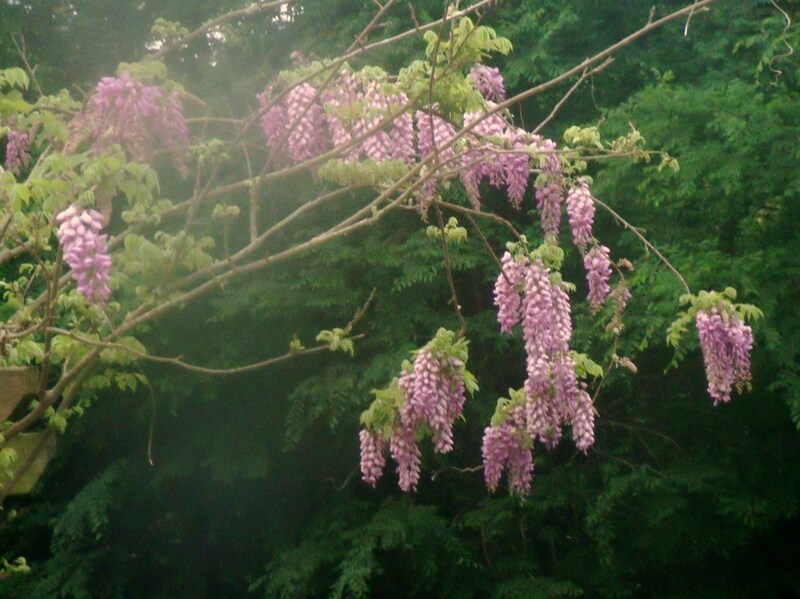 Huge clusters of grape wisteria gracefully spread across my pergola and seemed to reach out to me. Call me crazy, but it felt like a hug. I’ll take it. Thank you, Lord.